Ideal to add background music to your website because it will ensure a continuous and smooth playback across your entire website. Add background music to your website with Sticky Audio Player WordPress Plugin. It will ensure a continuous and smooth playback across your entire website. You can customize this html5 audio player by changing the color for: player background, volume slider, timer, buffer, seekbar, song title, playlist background, playlist font and playlist item line separator. Would be great if we could add soundcloud playlists too. But it's already super as it is! and I love the continuous playback feature. When you’ll change the page, the player will continue from the previous minute. Also, the volume will remain as previously set. This will ensure a smooth playback across your entire website. Parameter to load the player minimized or maximized when the page is opened. Option to automatically generate the player playlist from a folder which contains the MP3 files. Over 30 js options from where you can customize your player, including: autoplay, loop, initial volume, shuffle & color parameters. P.S. 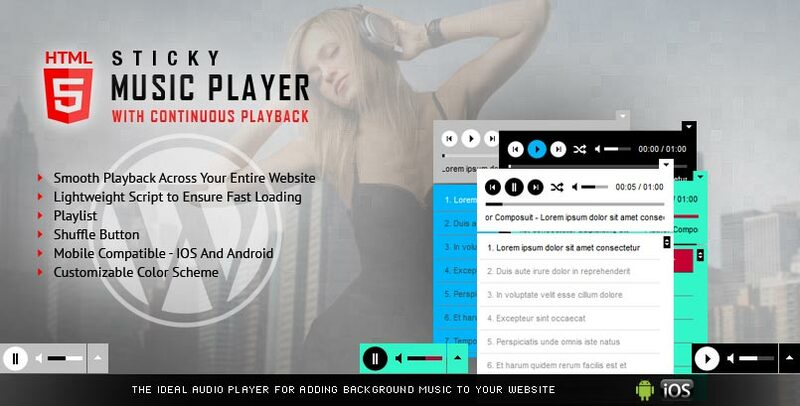 Sticky Audio Player WordPress Plugin is included in THE MOST WANTED WORDPRESS PLUGINS PACK along with Premium WordPress Sliders, Video Players, Logos Showcase, Full Screen Image Or Video Backgrounds, Radio Players, Carousels, Countdowns. You can make the acquisition of the century with a 90% discount!